Glass globe on a book with study abroad in the background. Photo courtesy of Shutterstock. Studying abroad can be an exciting, one-of-a-kind experience. From immersing yourself in the local culture to expanding your education and making lifelong friends, the opportunities offered by studying in a foreign country are endless. 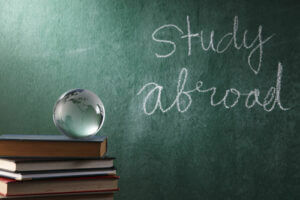 If you plan on studying abroad, check out the following tips for staying safe and adjusting to your new surroundings. ~Laws. For many students, adjusting to the laws in a foreign country is difficult. This can be remedied, however, through research and memorization. Take notes or, even better, consider a cheat sheet. Many well-meaning travelers end up in hot water after unwittingly breaking the law, so take this tip to heart. ~Geography. So you’re less likely to get lost, study maps of your new surroundings. Familiarize yourself with your new area, and make sure you know how to get to sites like hospitals, embassies, police stations, etc. ~Language. While fluency isn’t necessary, having a basic grasp on the language of your new location is extremely helpful. ~Customs. In addition to familiarizing yourself with the local laws, understanding the customs in a particular area is important as well. Studying the local customs and traditions will help you blend in, avoid social snafus and generally help you settle in to your new surroundings. Also, for female students, understanding rules regarding clothing and public behavior are essential. Prior to traveling abroad, getting a medical checkup is extremely important. Check with the university where you’ll be studying, and find out if there are any vaccination requirements for students, and make sure you’re up to date on all other inoculations. You should also request a copy of your vaccination record to bring with you abroad. Lastly, if you take prescription medications, be sure to get enough refills to last through the duration of your trip. ~Whenever possible, travel in groups.There’s safety in numbers, so avoid traveling alone, especially at night. Stay abreast of current events. Be aware of factors like political hostility and civil unrest, and be sure to avoid public demonstrations and other disturbances. ~Protect yourself from theft. Don’t flash cash, be sure to leave expensive jewelry at home, and avoid carrying bags that can be easily snatched. Also, it’s a good idea to keep a separate stash of money, either in your dorm or apartment, or on your person where it can’t be stolen. ~Protect your technology. In the event your phone, tablet or computer is stolen, protection is a must. Without it, you could become the victim of identity theft and other crimes. The solution is as simple as downloading tablet security software that provides you with protection and peace of mind. ~Be aware of your surroundings. Pay attention to the people around you, and avoid overly-friendly or pushy strangers. Don’t be afraid to run, scream or assert yourself if you feel threatened. ~Just say no. To protect yourself from danger, avoid drug use and excessive alcohol consumption. ~Check in. It’s a good idea to check in with your parents, friends or loved ones each and every day. ~Trust your instincts. If your gut tells you to avoid certain places, people or events, play it safe and go with your instincts. With all that said, remember to make the most of your time abroad. Have fun while getting an education and broadening your horizons, and try to enjoy every minute of this incredible, once-in-a-lifetime experience.